Losing weight isn’t very easy, but even small healthy habits can go a long way in making your weight loss journey a little bit quick and easy. There are some dietary practices that can help you get results faster like drinking warm water in the morning as well as before meals, or snacking healthy, etc. If you’re someone who wants to lose weight, then you would probably be familiar with these little tricks and home remedies for weight loss. However, there’s another lesser known home remedy for weight loss, which not many weight watchers are aware of – eating garlic seeped in honey on an empty stomach. A combination of honey and garlic might not seem very appetising, but it is very beneficial, when it comes to weight loss and improving your overall well-being. Consumption of raw garlic first thing in the morning is often recommended for improving digestion and detoxifying the body. In fact, raw garlic with water is a common home remedy for a number of health problems like hypertension, high blood pressure and high cholesterol levels. This is because of the many beneficial minerals and bioactive compounds present in this pale and pungent flavour enhancing vegetable. If you are someone who is in ‘detox mode,’ then garlic and honey is going to be a godsend for you. This is because this unusual tonic can help detoxify your body completely. But, perhaps its biggest health benefit is in aiding weight loss by stimulating appetite and boosting digestion. As health experts often say, a good digestive system is key to a quicker weight loss, honey and garlic are the ideal companions for your weight loss journey. Raw garlic has a better nutritive profile than cooked garlic, making the former a better weight loss agent. Similarly, consuming raw honey early in the morning may help metabolise fat better. Honey is fat-free and cholesterol-free and also helps in curbing hunger pangs. It is also a source of energy, helping you sail through all your morning tasks with ease. 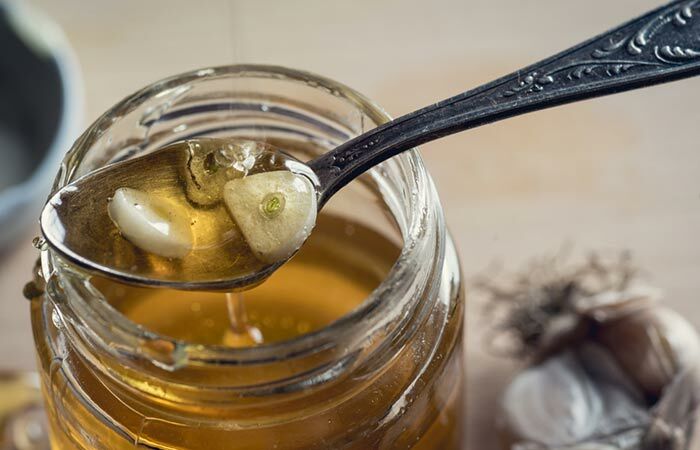 You can prepare the combination of honey and raw garlic and store it in a jar for daily consumption. All you need is some clean and fresh garlic cloves that are peeled, some raw or organic honey and a glass jar. Toss the peeled garlic cloves in the jar and pour the honey over them, till they’re fully covered in it. Shut the lid of the jar tightly and shake it to let the honey coat the garlics completely. Let the concoction sit for some time to allow the garlic nutrients seep out into the honey and vice versa. You can pick out one garlic clove daily, crush it with a spoon or a knife and eat it on an empty stomach to achieve quicker weight loss. Raw honey is the most original sweet liquid you will find. It is collected fresh after being produced by honeybees with the nectar they sip from flower blossoms. It is unheated, unpasteurised and unprocessed. This is not too difficult to understand as the word ‘raw’ clearly indicates being ‘uncooked’. This home remedy is good for your skin as well. This is because garlic is a natural blood purifier, which also has anti-bacterial properties. So, stop worrying about your weight and start losing it with this amazing healing combination.